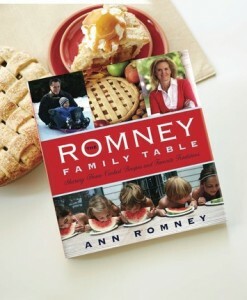 I knew as soon as I heard that Ann Romney was going to be coming out with a cookbook that I just had to have it! I have always been an admirer of her and her family. You can tell from all the family photos she’s posted on her social media (and in this new book!) that she and her husband love each other and their family more than anything else. Which is why she wrote this book – and it is much more than a cookbook; while she certainly shares a lot of amazing recipes (my picky eater devoured her daughter-in-law Jen’s Crispy Chicken with Dipping Sauces on page 19), she also shares many family traditions from their summers at the lake, family birthdays, and Christmas Eve. The thing that you’ll notice after reading through this book is that every occasion, every tradition, and every memory involves bringing people together through food. We all know that it is important to eat dinner together as a family as often as we can. It brings a great opportunity to spend time together, enjoy each other’s company, it opens discussion, and we can all share great food together. Ann Romney’s book demonstrates this in abundance! Another thing I (happily) noticed while looking at all the pictures is that her family could be similar to mine! The kids have messy spaghetti sauce-stained faces, the cookie sheets aren’t polished to perfection, and the kids’ birthday cake is not expertly decorated. Everything seems so doable, and normal, and without pressure – which is why I love this book. It gives me great ideas for feeding and raising my family without making me feel like those ideas are unattainable or out of reach. I love that the recipes included are normal family-fare; from her mother’s pancakes made every weekend, to the Chili con Carne made in less than an hour, and the easy roasted chicken for Sunday dinner…these are all recipes that the everyday mom can make for her family. The ingredients are pantry staples and the recipes are easy to follow. THAT is a cookbook worth having, in my opinion! One where I can actually make the recipes without having to break the bank and that I know my family will love! This book is a New York Times Bestseller – and it only came out October 1st! That tells you a lot right there – there are so many people who are inspired by Ann Romney and know that she is a genuine person with a great love for family, tradition, and sharing those things with others. 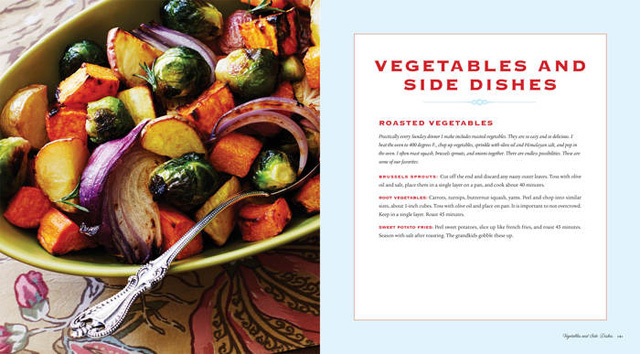 To get a copy of this amazing hardcover (cook)book for yourself or a friend (this would make a fabulous Christmas gift! ), visit Deseret Book. I think you’ll agree with me – this book is a must-have!! I received a copy of this book in return for my honest review. All opinions are, as always, 110% my own.